From Blowing Rock: Take 321 toward Boone, 1.6 mile past Shoppes on the Parkway. Turn Right on Aho Road and go 2.3 miles. Turn Right onto the Blue Ridge Parkway. Go .1 miles and turn Left onto Sampson Road. Take Sampson Road .5 miles, farm is on your right. 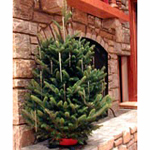 Featuring Fraser fir trees, wreaths and garlands. Magnificent mountain views, wooded footpaths, and landscaped gardens provide the ultimate picturesque setting for Apple Hill Farm's animals and visitors. Apple Hill farm is home to alpacas, goats, donkeys, chickens, dogs and more. Don't forget their extensive supply of alpaca accessories in their farm store! Call year round to visit. Dedicated to strengthening the High Country's local food system by supporting women and their families with resources, education, and skills related to sustainable food and agriculture. Nestled between the high mountain terraced vineyard and the pristine trout waters of the Watauga River is the first producing winery in Watauga County. Join us for a glass of award winning wine. Spring hours: Wednesday-Saturday 12-6pm, Sunday 1-5pm, and Monday 12-6pm. Contact us for your special events, weddings, and parties. We will soon be posting dates for our Sunday afternoon Music In The Vineyard. Check our website for these upcoming events. Elevate your taste in wine at LINVILLE FALLS WINERY and make us a part of your Blue Ridge Mountain experience. Our vineyards are nourished by warm days, cool nights and rich mountain soil like no other place on earth. Tasting daily 12:00-6:00. Please call for winter hours.